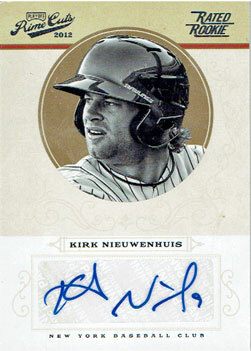 This 2012 Panini Prime Cuts Kirk Nieuwenhuis baseball card is a recent addition to my collection. The New York Mets wrapped up the first half of the 2015 baseball season with a 5-3 victory over the Arizona Diamondbacks on Sunday afternoon. Kirk Nieuwenhuis became the 10th player in Mets history to hit three home runs in one game, and he’s the first to do it in the Mets’ home ballpark. Back during spring training, I think we’d all have agreed that a 47-42 record at the All-Star Break (just two games behind the Washington Nationals in the N.L. East and one game behind the Chicago Cubs for the second wild card) would be a successful start to the season. The 2015 Mets have problems. It’s not clear when (or if) we will see David Wright or Travis d’Arnaud on the field again this year. The team ranks dead last in the National League in runs scored, hits, total bases, and batting average. They’re 14th in on-base percentage and 10th in home runs. But their starting pitching is good enough to give the Mets a shot to win almost every night and Jeurys Familia has been the team’s MVP after inheriting the closer’s job when Jenrry Mejia was suspended. It’s painful to watch the Mets waste great pitching performances because they can’t score runs, but it’s fun to watch those great pitching performances. This may not be the year for the Mets to go all-in at the trade deadline, but the team they have has shown enough promise (and enough problems) that they have to do something to upgrade before the July 31 trade deadline if they expect anyone to believe that the front office cares about winning. It’s probably asking to much to expect an upgrade over Ruben Tejada at shortstop in the next couple of weeks, but doing something to strengthen the outfield seems like a legitimate goal. Michael Cuddyer‘s been disappointing this year, but for his career he’s been better against lefties. Curtis Granderson is having a great season – against righties. Against lefties, he’s hitting .119. Seems like you’d gain if you could platoon the two veterans and find another left fielder. You’d also be improving a bench that’s been less productive than the Mets starting pitchers at the plate. And that seems like the kind of move you could make with second-tier prospects that don’t fit an immediate need and wouldn’t jeopardize the team’s long-term plans. If Sandy Alderson stands pat, it’s going to be very demoralizing for the fans… but probably also for the players and manager Terry Collins. July is too early to say “wait until next year” this time.